Need to whip up a quick desert this Thanksgiving? Need a sweat treat that looks like you are a master baker? 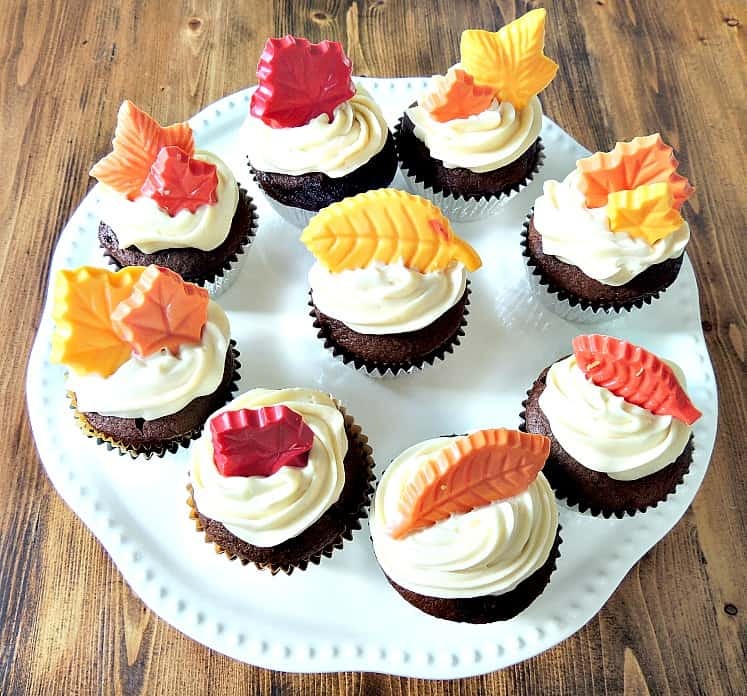 How about these fancy Thanksgiving Fall Leaf Chocolate Cupcakes? They are simply chocolate cupcakes with vanilla butter-cream frosting and topped with a candy leaf. Simple and quick but they look pretty impressive! You can make the chocolate cupcake using either my chocolate cupcake recipe or a box version such as Betty Crocker’s Devils Food Cake mix (I’m don’t usually use box mix – but this one is actually really good!). Once the cupcakes have cooled, frost with a simple butter-cream frosting and add the candy leaves. To make the leaves I purchased some candy wafers from AC Moore, melted them down and popped them into a chocolate mold (affiliate link). 10 minutes in the freezer and they were set and ready to go on the cupcakes! Not too bad, right? And from start to finish they literally took a total of 40 minutes! If you enjoyed this recipe, take a look at my Incredibly Indulgent Chocolate Cupcakes!